Let's get right to the point. I'm up for a challenge. I like dare devil things. I like to drive fast. I like rodeo. I put 'em all together on Saturday. Every year the Central Washington University Rodeo Club hosts one stop on the Northwest Regional schedule right here at the Ellensburg Rodeo arena. 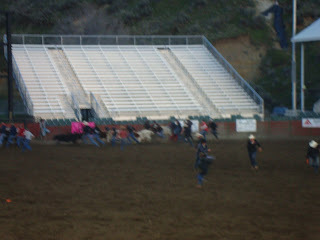 Every year they have a calf scramble and for some reason or another, I had never entered until this year. What's the calf scramble? You have a herd of calves. They have ribbons tied to their tails. A bunch of non-sober college kids (and one over the hill red head) chase the calves in the middle of an arena trying to get the ribbon for the prize. What was the prize? I have no idea, I didn't win. If you can tell in the blurry image, this is early on in the scramble. I'm one of the blurs trying to catch another blur. Probably like everyone, our Easter weekend was spent with lots of family and while we didn't get to see everyone, we were still able to have a good time. 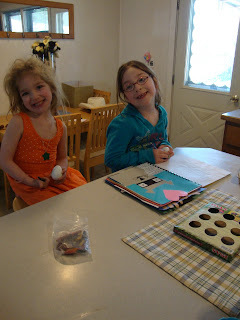 The girls had an Easter Egg hunt all three days of the weekend, so obviously there is candy in the house that mom and dad are stealing as I write this. As always we dyed Easter eggs. The girls are always so creative with their colors. As the picture would indicate, they were behaving pretty well here. I happened to take this shot just as Addy dumped an egg in the blue egg dye. As you can tell, it splash in her face. My trio, beautiful as ever. Me and the girls showcasing our favorite eggs. One of the Easter egg hunts was at the rodeo arena during the college rodeo hosted by CWU's rodeo club. The annual rodeo happened to fall on the same weekend as Easter weekend and the club covered the entire arena floor (almost the size of a football field) with eggs. 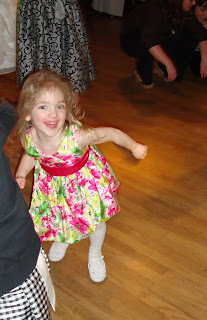 Trying to start blogging again!